Thornbridge are a brewery better known for their big hop beasties, but in addition to the fairly widely available beers like Jaipur and Kipling they also have their “Thornbridge Hall” range; beers with very different branding that are a little bit different. 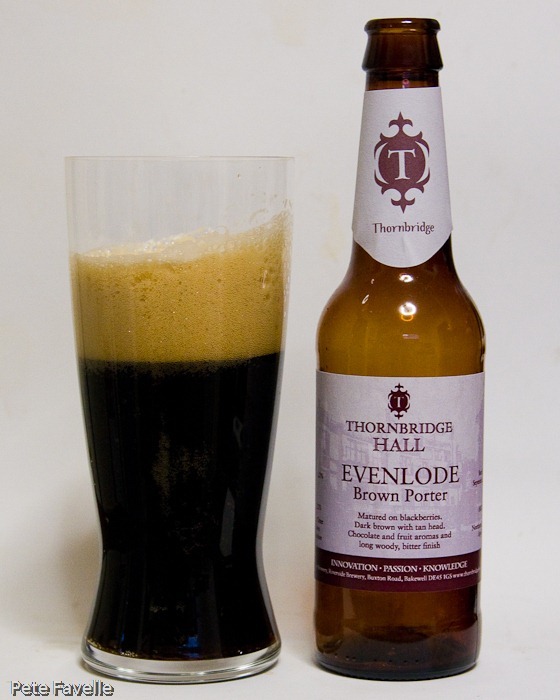 This is their Evenlode Brown Porter, which is matured on blackberries. 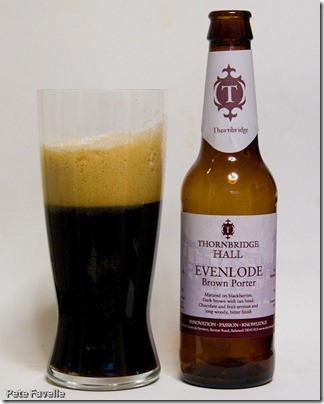 A very dark brown in the glass, it has a deep, fine bubbled and lingering tan head on it. The nose is full of sweet molasses, along with some roasted malts and just a suggestion of dark berry fruit and alcohol. The taste is curious; it starts out sweet and almost syrupy before an almost vinous tannic character leads into a deeply dry finish – presumably coming from that blackberry maturation. The fruit is there too, but it’s subtle. I’m actually undecided as to whether or not I like this beer; it’s interesting and the flavour journey is unexpected, but the dry finish is almost overwhelming.